Crash, also known as Thirteen-Card Brag, is a more laid-back, social variant of Brag for two to four players. There are two main differences between Crash and Brag. First, in Crash, a player receives thirteen cards, and divides them into up to four three-card Brag hands. In essence, Crash does to Brag what Chinese Poker does to poker. Additionally, the usual Brag betting mechanic is stripped away in favor of a simple point scoring method. If money is involved, it is in the form of an agreed-upon payment from the losers to the winner. The object of Crash is to split the thirteen-card hand given to a player into four Brag hands in such a way that, ideally, each of the hands is stronger than their opponents’ hands. To play Crash, you’ll need a standard 52-card deck of playing cards. 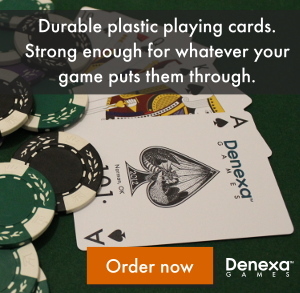 We, of course, endorse choosing Denexa 100% Plastic Playing Cards for your game. You’ll also want something to keep score with. Specialized scoreboards are available, but you can just use pencil and paper (or a mobile scorekeeping app) if that’s all you have handy. Shuffle and deal thirteen cards to each player. Any undealt cards are set aside and not used. Each player looks at their hand and decides how to divide it into up to four three-card Brag hands. (If you’re not a Brag expert, here’s the rank of Brag hands). Each hand formed must be at least a pair or better. Players will have at least one card left over; they may have more if they cannot (or don’t want to) form at least a pair in all four possible hands. All unused cards are simply discarded. When a player has set their hand in a way they’re satisfied with, they place their three-card hands face down in front of them, with the highest-ranking hand the furthest to the left, the next-highest hand just to the right of it, and so on, with the lowest-ranked hand to the far right. 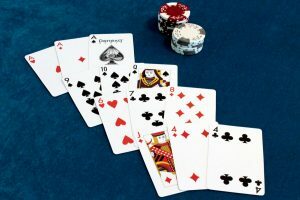 After all players have set their hand, each player turns up their highest-ranked hand and compares them with each of their opponents. Whichever player has the highest hand scores one point. The players then turn up the second-highest hand, with the holder of highest scoring a point. This repeats for the third and fourth hands. A tie for highest hand is called a stick-up or stopper, and nobody scores for that particular hand. Note that if a player did not form four hands, their highest ranked hand must still always be scored as hand #1, the second as #2, etc. A player with, say, only three hands simply does not compete for hand #4. If, at any time, a player’s hands are found to have been placed out of order, this constitutes a foul. A player who fouls their hand automatically loses the game and takes no further part in game play. If one player scores for all four points on a hand, it is called a crash. A player that scores a crash automatically wins the game. If a player has four of a kind and uses all four cards in their set hands (i.e. does not discard any of them), the player scores one extra point. Should multiple players hold four-of-a-kinds, only the highest-ranking four of a kind gets the bonus point. For the purposes of ranking four-of-a-kinds, 4s are the highest rank, then aces, then the rest of the ranks in their usual order. 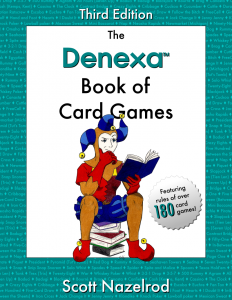 If a player has a thirteen-card straight, from ace down to 2, they may simply reveal their hand, which automatically wins the game. After all four hands have been evaluated, the deal passes to the left, and new thirteen-card hands are dealt. Game play continues until one player reaches a score of seven points. That player immediately wins; no further hands are evaluated once a player reaches a score of seven. In Scotland, 13 Card Brag is called ‘Crackers’. 3 Card Brag is a very popular card game in our country. with three-handed Clobyosh being played more on the East coast. The two-handed version of Clobyosh is the one I like playing most of all. I’ve also seen this same card game called Klavyasch in a newspaper article from the 1940s. as being the Hungarian version of gin rummy played by Hollywood stars such as Dana Andrews and Brian Donlevy.